Our product range includes a wide range of pedestrian guardrail, stainless steel glass railing, stainless steel guard railing and pedestrian guard rail. Specifically designed for highway applications,Pedestrian Guard Rails provide an effective roadside barrier for pedestrians while allowing good visibility from a motorists view point. 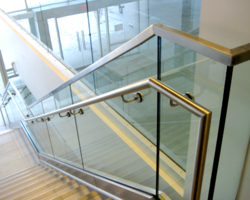 Our expert team allows us to manufacture and export leading products of Stainless Steel Glass Railing. We use refined technologies and machinery for manufacturing these products. 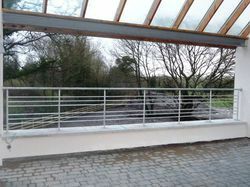 These are manufactured using premium glass materials and steels purchased from leading sellers. The extraordinary features of this are clear glass with metal outer boundaries, stylish look and are hard to break. 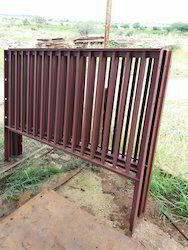 It is useful in constructing railings in Spencer’s, malls, corporate firms. It prevents car from breakaway, and leads attention. Installation: Solid and light material. Short construction period and low construction cost. Pedestrian Guardrail ROW Fencing Solutions" manufacture pedestrian guardrail specifically designed to meet various types of road conditions. Supplied with separate open-ended posts to allow maximum visibility and available with four types of infill bar arrangement to suit much application. For almost 10 years we have been the preferred supplier to many domestic Civil Engineering Contractors who choose "Pedestrian Guardrail ROW Fencing Solutions" based upon quality products and a high level of customer service. Using all of our experience we are able to offer sound advice on suitable solutions when specifying Pedestrian Guardrail. The most basic and cost-effective form of Pedestrian Guardrail is our unit panel designs which are available as a full height version or a sight gap version. The size of the infill bars can be increased as per specific site or drawing requirements to suit additional loading requirements. 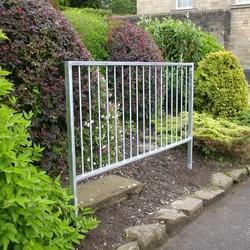 All of our Pedestrian Guardrail’s meet national safety standards. We’re normally supplied in standard bay sizes and although special length, radius and raked panels can be provided. The basic finish is hot dipped galvanized to meet national standards with options for a polyester powder coated finish available. High Visibility Pedestrian Guardrail: For the ultimate in high visibility guardrail our innovative designing is the answer. The basic function of the pedestrian guardrail is to guide pedestrians to safe crossing points. It is a fact, however, that conventional guardrail will at certain approach angles obscure small children or animals from approaching motorists. Thus, posing is the danger of crossing points. A similar problem applies to drivers turning right at junctions. The purpose of our innovative designed pedestrian guardrail is to dramatically improve the inter-visibility of a pedestrian guardrail. The basic objectives are therefore achieved without penalty.